It's no wonder that Valentine and Violin Both Begin With the Letter V! Is there any other instrument that is so romantic? Teddy Bears are Great Any Time, But Especially on Valentine's Day. This Little Guy Lets People Know What You Love Best . . . Not Necessarily in That Order. Your Valentine Will Thank You For This Gift! Beary Beary Much! Frank Sinatra: Frank Sinatra Songbook Is anyone more romantic than "Old Blue Eyes?" Piano/vocal/chords songbook. With vocal melody which the violin can play. 372 pages. Nat "King" Cole: Unforgettable Piano/vocal/chords songbook with vocal melody which the violin can play. 100 pages. Selections From VH1's 100 Greatest Love Songs With vocal melody violin can play, piano accompaniment, lyrics, chords. 494 pages. The Barry Manilow Anthology With vocal melody violin can play, piano accompaniment, lyrics, chords. 312 pages. Popular Love Songs & Wedding Music - Easy Piano Arranged by Dan Coates. For voice and piano. Format: easy piano/vocal/chords songbook. With easy piano notation, lyrics and chord names.156 pages. Love Songs Of The 40s & 50s - Easy Piano For voice and piano. With vocal melody which the violin can play. 200 pages. Irving Berlin: Anthology Piano/vocal/chords songbook. With vocal melody violin can play, piano accompaniment, lyrics. 280 pages. Essential Songs - Movie Songs With vocal melody violin can play, piano accompaniment, lyrics, chords. Movies. 399 pages. 9x12 inches. The Standards Real Book - C Edition For C instruments (including violin) and voice. Format: fakebook (spiral bound). With vocal melody which violin can play, lyrics, chord names. Standards. 574 pages. Elvis Presley: Can't Help Falling In Love Perhaps the Greatest Love Song of All Time. With vocal melody which the violin can play, piano accompaniment, lyrics, guitar chords. F Major. 4 pages. The Ultimate Love And Wedding SongbookWith vocal melody violin can play, piano accompaniment, lyrics, and chords. 286 pages. The Best Love Songs EverEasy keyboard (right hand only)/vocal songbook. With vocal melody that violin can play, lyrics, and chords. 192 pages. Some Music-Related, Some Just Plain Nice. All Greatly Appreciated. Your Beau Will Love the Way You Play! Jewelry Will Make Her Smile! 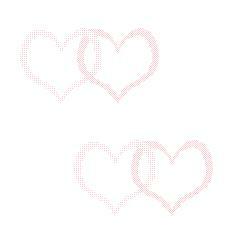 Heart Smiles Glossy Paper Stickers Heart-shaped mini dots in a 2500 sticker value pack. 25 sheets of smiling hearts in red, purple, orange, blue, yellow, green and pink. Stickers are approximately .5 x .5 inches and are great for use in creative play. Great motivators for Suzuki and Classroom teachers. The Beatles - Complete Scores Complete score songbook with vocal melody the violin can play. 1136 pages.